IE's School of Global and Public Affairs and the United Nations System Staff College have partnered to provide world-class training for professionals who want to tackle the complex challenges associated with the 2030 Agenda for Sustainable Development. Students of the Master in International Development will receive world-class training that will enable them to promote sustainable social, economic and environmental prosperity around the world. The curriculum encompasses the 5 P’s defined by the UN’s 2030 Agenda for Sustainable Development: People, Planet, Prosperity, Peace, and Partnership. The United Nations System Staff College has built the curriculum for this Master together with IE experts and professors. Provided in the tuition is an immersion week to a United Nations operation where students will gain first-hand experience in a development mission. 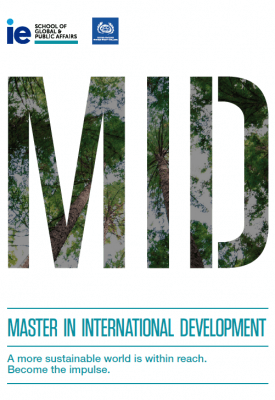 The Master in International Development equips students with the tools to develop, design, implement and evaluate new solutions touching on topics such as inequality, access to education, eradicating poverty and other issues negatively impacting the world. Our partnership with the United Nations System Staff College (UNSSC) reinforces the learning experience, setting students up with the skills and opportunities they need to start or develop a career in international development. IE’s learning methodology focuses on practical cases, teamwork, consulting projects, business simulations, and class debates. Additional teaching methods include case studies, simulation exercises, field experiences and in-class use of technological tools for applied learning. Students will acquire a comprehensive understanding of the field, enabling them to quickly analyze and dissect each challenge, anticipate the possible outcomes and create innovative solutions to drive positive change. Students in the MID will be lectured by United Nations experts and practitioners, visit UN offices and, at the end of their program, receive a certificate from the UNSSC. Students will receive support, encouragement and facilitation for field internships and careers within the UN system and other top organizations. Students will get the chance to engage with top professionals and experts from the UN system and other top organizations through courses, seminars, capstone projects and special events. 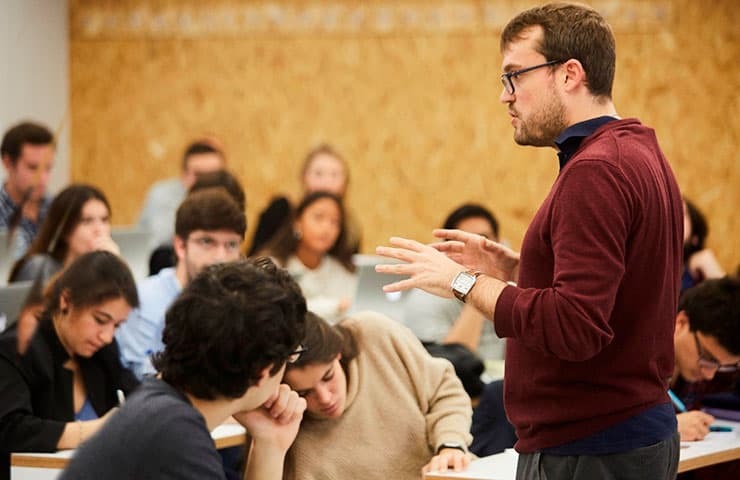 Beyond being a full member of the Association for Professional Schools of International Affairs (APSIA), IE ranks as the 5th European Business School and its online MBA ranks #1 worldwide. More than 130 nationalities on campus every year. More than 60,000 high-level professionals around the world have already graduated from IE and stay connected through our Alumni Association. A bridge between Europe and America where you can learn the third most spoken language in the world.